There’s something so special about fresh, sweet, locally grown corn at the end of summer. At any other point during the year, we rarely even think about eating corn or using it in recipes. And, in fact, some of our clients have dietary sensitivities and feel better when they don’t eat corn. Similar to soy and wheat, corn has been grown in massive quantities and is used in large scale production for many types of processed foods that use poor quality corn flour, corn starch or even corn syrup. This isn’t the type of corn that we are talking about eating. Fresh corn on the cob is actually full of nutrients, especially B vitamins and, of course, a lot of insoluble and some soluble fiber (the insoluble fiber is what some people find irritates their digestion). It’s important to buy organic corn to ensure that you are eating a high quality, nutrient dense variety of corn. When grown organically, corn is also rich in phytonutrients that have antioxidant properties that protect your cells from damage. This time of year, as the summer is slowly turning into fall, there are so many delicious vegetables harvested in abundance. We love combining these veggies together in salads with simple, flavourful dressings for a delicious lunch or pairing with some sort of heartier option like chickpeas, kidney beans, nuts, seeds, fresh fish or grilled chicken. Another delicious modification that you can make to this recipe is to grill the red peppers and corn before chopping and adding into the salad. Rinse off the lettuce, dry well and chop roughly into smaller pieces. Steam the corn for a few minutes until crisp. Then cut the kernels off the cob. Chop the pepper and cucumber. Prepare any other veggies or herbs that you’d like to add into the salad. Mix the veggies all together, except for the avocado. 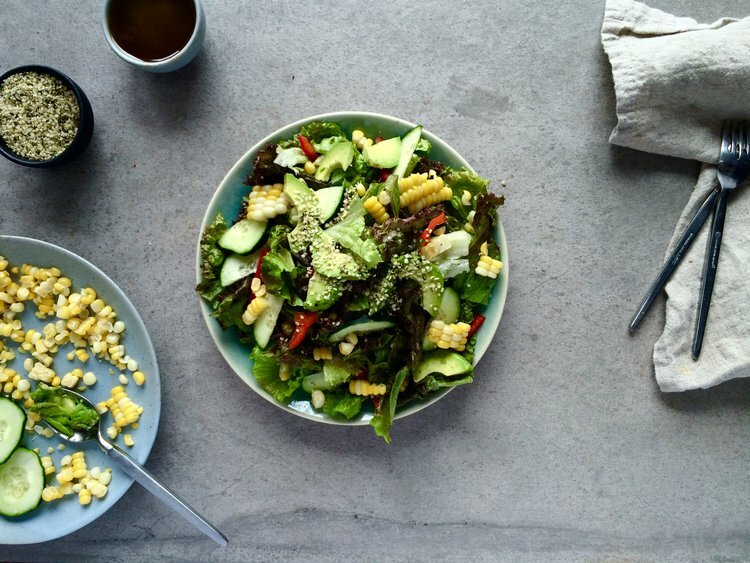 Make dressing ingredients together and toss with the salad when ready to serve. Slice the avocado and add on top of the salad before serving. You can also add hempseeds and fresh herbs.